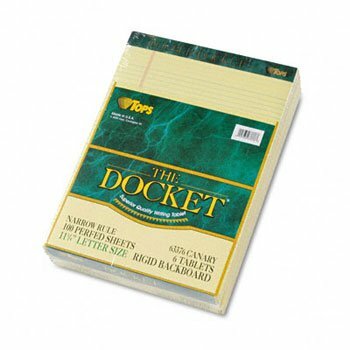 This ruled double pad has rigid back for writing support. Letr-Trim® perforation for clean tear-out. Double-stitched top. Double-sized for extra-large jobs. Rigid back for writing support. Letr-Trim® perforation for clean tear-out. Double-stitched top. Six pads per pack, unless otherwise noted. Global Product Type: Paper Pads/Note Pads-Ruled; Pad Type: Ruled; Sheet Size (W x H): 8 1/2 in x 11 3/4 in; Ruling Color(s): N/A.